I have taken stadium tours of Barcelona, Real Madrid, Juventus, Arsenal and Liverpool. However, the Newcastle United stadium tour is the one which gives the visitors the most attention and detail. I arrived at the stadium without a ticket and bought one on the day but it’s possible to book your Stadium Tour online. St James’ Park is located in the city center of Newcastle. Wherever you’re staying in the city it’s likely you’ll be able to walk to the stadium. I was staying at the Staybridge Suites and it took me about 15 minutes to walk to the stadium. The stadium is huge which in itself tempts you to take a tour. 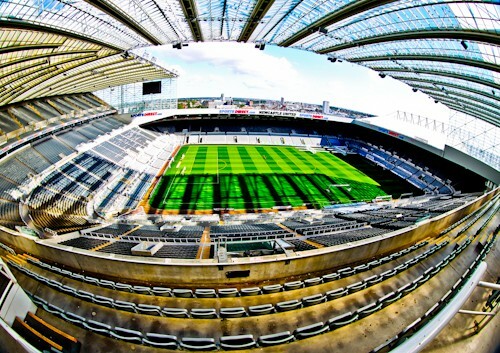 The history of St James’ park dates back to the 19th century making it one of the oldest stadium locations in the Premier League and the world. The first stop on the Newcastle United stadium tour is to the top of the Milburn Stand. This is largest and most impressive stand. It’s high up but you do get taken up in the elevators. From the very top of the Milburn Stand you not only get a birds eye view of the pitch but a brilliant view of Newcastle city center. There’s a map at the top of the stand pointing out the names of each building in the city. The most prominent being the Civic Centre. The other huge stand to the left is the Leazes Stand. The away fans have seats allocated in the top corner of this stand, as a result they’re as far away from the pitch as possible. Next stop are the executive boxes, these cost thousands of dollars for a season ticket and that doesn’t include the drinks! It’s interesting to see how luxurious watching a football game can be. It’s also interesting to learn about the strict alcohol laws in the UK. You’re not allowed to stand at the window of the executive box with an alcoholic drink in your hand. Having mentioned the no drinking in the open rule, many football fans will remember seeing Newcastle United owner Mike Ashley drinking pints out in the open in the stadium. The guide stated that that are 65 bars inside the stadium. The justification for there being so many bars is that if you’re a Newcastle United fan then you need a drink! This part of the stadium has seats with the best view of the pitch. When Steve McClaren was manager he tried to organize the team from this part of the stadium. In addition, there’s a seat in this section reserved for the late Sir Bobby Robson. Sir Bobby is a Newcastle legend who managed big football clubs such as Barcelona as well as the England national team. His seat is left empty to honor him, unless of course one of his family members is in the stadium and they can use it. The guide explained on a cold rainy night when the winds blowing in from the North Sea it’s not the best place to be sat! The away teams dressing room is nothing special which is how it’s supposed to be. It’s small, there’re no lockers and it’s either too hot or too cold. This is to give the home team an advantage. Can you imagine Cristiano Ronaldo or Lionel Messi using this changing room? Where would they keep all their belongings? 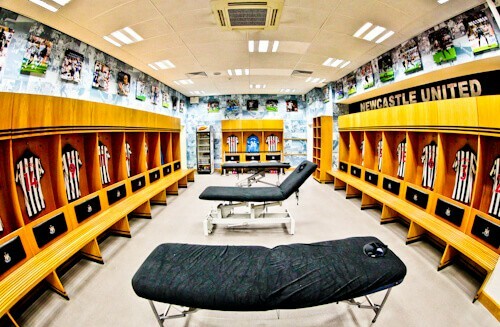 The changing rooms are designed to get players out of their comfort zone when visiting St James’ Park. If you compare the home team dressing rooms to the away teams you’ll see why the home team has an advantage. 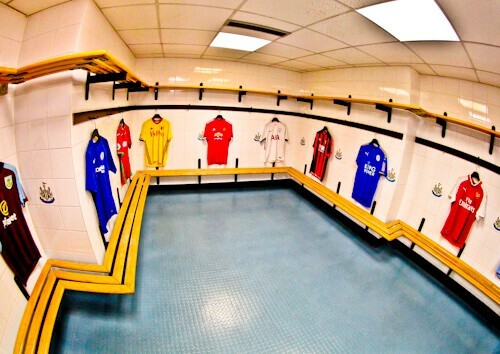 These changing rooms are state of the art and were inspired by the changing rooms at the Emirates and Wembley. There are lockers, refreshments, massage benches and it also looks good. Furthermore, there’s a lot more space here too in comparison to the away changing rooms. If you’re taking the stadium tour with kids this is the part they will enjoy the most. The tour guide will put on the same music they play on match day. The kids are then invited to walk down the tunnel to the pitch, exactly as players do. The adults also take the walk but the kids go first! There is a message for the Newcastle team stating ‘Howay the lads’. This means ‘Come on lads’ in Geordie (I think!). It’s worth mentioning that many famous footballers have walked through this tunnel. Players including David Beckham, Cristiano Ronaldo and Wayne Rooney. Famous Newcastle players include Alan Shearer, Peter Beardsley, David Ginola, Paul Gascoigne as well as Kevin Keegan. You’re invited to sit in the dugout where so many famous managers have sat. Managers such as Rafa Benitez, Ruud Gullit, Kevin Keegan and Sir Bobby Robson have managed Newcastle United. Additionally, many famous managers have visited St James’ Park including Jose Mourinho, Sir Alex Ferguson, Arsene Wenger, Pep Guardiola and Antonio Conte. An interesting fact about the seats in that for the Newcastle side, they’re heated but for the visiting teams they’re not. 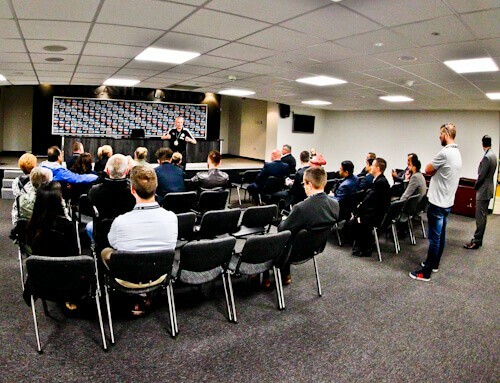 As part of the tour you’ll see the Newcastle United Press Room. When you see a Newcastle United press conference on TV it’ll have been filmed in this room. The guide was keen to mention when the press room was at its fullest. In the Champions League in 1997 Newcastle beat Barcelona 3-2 after a hat trick by Colombian Faustino Asprilla. This was a huge story and press were queued up outside trying to get their story. 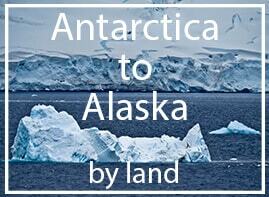 The tour takes about 90 minutes and you’ll be accompanied by a knowledgeable guide the whole time. 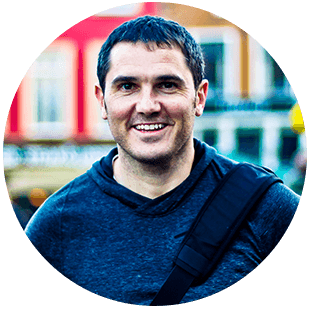 Feel free to ask the guide as many questions as you want, they are really keen to talk about their team as well as the city of Newcastle. If you want to take unique photos of the stadium, ask the guide for tips, they can also take your photo for you. I took a standard Stadium Tour but it’s also possible to take match day tours if you are also visiting to watch a match. 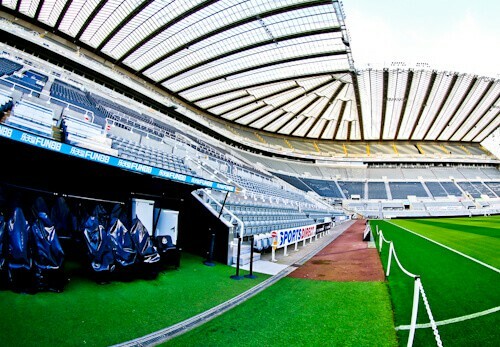 Enjoy your stadium tour of St James’ Park, home of Newcastle United. If you need a place to stay in Newcastle whilst visiting the Stadium, I recommend the Staybridge Suites. Check out the Anfield Stadium Tour, home of Liverpool FC. What an awesome experience it must be to take a Newcastle United Stadium tour. I’d love to do the match day tour, see the stadium then see the game. I was a big fan of Alan Shearer so it would be interesting to learn more about his home team. I’m not too much a fan of soccer but I’d not mind walking the same places as famous footballers. Especially the tunnel. I can’t but laugh out loud seeing the differences between the home team dressing room and the away team’s. It’s like a 5 star hotel vs a cheap 1 star. I can’t imagine Ronaldo here.???????????? Hands up James, I’m definitely not a football fan, but St James Park Stadium looks really interesting. I love the difference between the dressing rooms, talk about psychological mindgames. I have to say, I’d love to try and watch a match from that luxury box; I can only imagine the kind of treatment they get in there! Walking through the tunnel would be really fun too. St. James stadium is beautiful. I think I’ve seen the home’s team locker room in the news before. I’d agree to a tour in the Stadium with a kid not kids. The latter might just be too happy exploring the big stadium, thus making me lose hold. 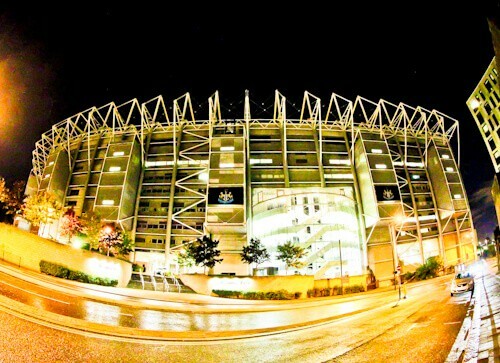 St. James stadium would definitely be on my list of places to check out! My husband toured the stadium in Barcelona and his photos were amazing! We like taking visitors to the Seattle Seahawks stadium. I must admit I am not a big fan of football, but you convinced me to go to an empty stadium at least LOL! Did you get to play a little too during the tour? Love the pictures too! Not much of a soccer fan myself, but would love to visit the stadium. Yesterday only I visited the Headingley Carnegie Stadium in Leeds, and I was literally in awe. The stadium that I had seen in my TV screens, was right there in front of my eyes. Would definitely check out the Stadium tours as well. I’ve been to a couple of stadium tours only in London. Being a total football fan, my husband wouldn’t miss it for sure! Those home and away dressing rooms are just awesome. Reminds me of my own Wembley and Arsenal tours! The media seating section looks perfect for a view! I don’t know much about football, but this sounds like a pretty great tour. It’s nice that the tour groups are small and you have time to see so much. It’s interesting to learn about the difference between the away and home dressing rooms. Would have never thought the aways would be smaller and more basic than the home, but it makes sense. This must be a dream trip for sports fans around the world! I’m not the biggest football fan but even I myself feel excited when looking at your photos of this stadium. This place is really worth a visit for everyone I think! This sounds like a perfect spot for any football fan to explore! I think stadiums offer their own bit of history to a town and country in their own way. Looks like it makes for an interesting day out in Newcastle! I think my husband would think he had died and gone to heaven if I booked this tour for him. So Xmas present it is, tours like this make a city so much more interesting as they are insights into the local culture and in particular being a Canadian it’s pretty cool to see all the places we hear about so often when watching British football on the telly. So hilarious that the away team’s locker room is either too cold or too hot! A bit of a cheeky (or strategic?) arrangement. Sounds like a really fun tour. Interesting to read that you’re not allowed to drink at the window of the executive boxes – would not have guessed! We’ve been to Newcastle a few times, such a great city with awesome nightlife. I’m not much of a footie fan but I’m sure my partner would love the tour, it looks like it gives a real insight into the stadium! Great pictures. 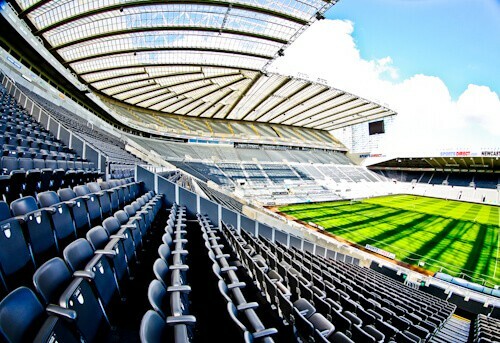 I’ve attended a few games at St James Park and it’s a pretty impressive stadium. To be honest, I didn’t even know they offered a stadium tour! Really cool photos, does look great and Newcastle itself is worth a visit anyway! I’m not much of a football fan but I can imagine that fans would get a big thrill from visiting this iconic stadium. In Australia you can tour the Melbourne Cricket Ground which is supposed to be incredible. But you would need to be a fan of cricket or AFL football to enjoy this. I didn’t even know you could tour empty stadiums!! But that’s a fun things to do for kids interested in sports as well! The changing rooms are a good little tease for the visiting team and it must be quite thrilling to walk up that tunnel where all the players get to walk before the matches. My kids would love to experience a St James’ park Stadium tour. All the details about the locker room and the field are really interesting. 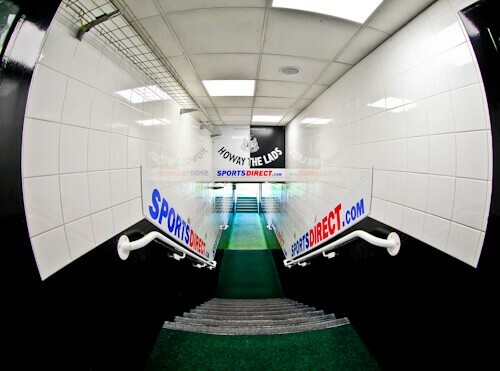 The kids would love walking down the players tunnel to the match day music! I’d have to get to the end of the tunnel first to video them coming through! 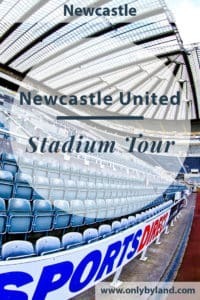 I’m heading to a Newcastle game, the stadium tour before a game must be incredible. I like the idea of having a guide, I’ve been to Camp Nou and Bernabeu and its a really un personal self guided tour. Walking down the players tunnel sounds a unique experience.